Fairly recently I’ve gotten to know a couple of incredible women who absolutely personify joy. We are all off to Santa Fe the weekend of August 6-7 to sell our wares on the square at the Girls Inc. Arts and Crafts Show, which donates its proceeds to Girls Inc. of Santa Fe, a non-profit organization that inspires all girls to be strong, smart, and bold. This will not only be a welcome road trip with two totally awesome women, but my first opportunity of this magnitude. My goal this year has been focus on my art, beginning with launching this website and venturing into the world of blogging, which has brought about new friendships and opportunities, as well as great introspection and expression. My heartfelt thanks go out to all of you who have participated in this most pleasurable journey so far! ~ by Dawn Elliott on July 7, 2011. Oh have loads of fun Dawn. What a great picture filled with joy. Awesome. Sounds like it will be an exciting time and hope you sell a lot. Take care. Wish I was as lucky.. but then I think I am.. getting connected here too is a kind of blessing.. for its happiness sprinkled here.. Thank you.. do visit to see me having turned into a bird..came through Rebecca’s place..
Wishing you well!!! Sounds like a tremendous opportunity! here’s to new friends, and the joy of singing out their praises! your august trek to santa fe sounds fabulosa!!! rock on dawn! “that inspires all girls to be strong, smart, and bold” – that sounds like a wonderful objective. I wish you good luck with your art. A joyful haiku and a joyful post… I love girls who are strong, smart and bold. No better goal for youngsters in this world then this! I will see you there! 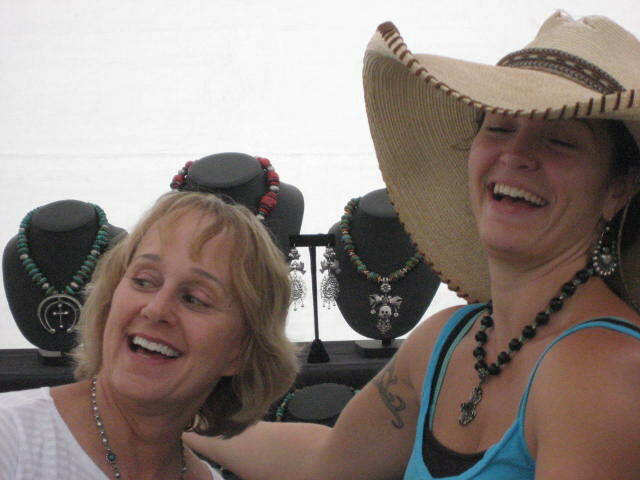 I am going to Santa Fe that weekend with my girlfriends to see the SOFA show and the Outsider/Folkart show…and to play! Didn’t know about this other one. Have fun with your art sisters, sell oodles of art, make connections and safe home. Wonderful! Santa Fe is awesome.Enjoy it to the max with Bloggerista’s! Go Girls Inc.
Oh! This sounds wonderful! Have the very best time! Santa Fe *and* Girls Inc *and* art? Somebody’s living right! Your Aug. 6-7 trip sounds phenomenal and I love your photo and haiku. Hope you sell lots and lots. Such a wonderful, joyful post! Love the photo – happiness! how wonderful…this photo oozes with JOY! Wow Dawn. How wonderful that you are selling your work for such a worthy cause and having a great trip with friends in the bargain. I have family in Santa Fe. I lived there for a year. August is a hot month but lovely and it is also the month of the Indian Market which draws tourists from everywhere on the planet. I hope you have a great time!